A lot of efforts still need to be put into raising awareness about solar thermal technologies meeting industrial heat demand. But the good news is that there are three events planned for November to promote solar heat for industrial processes (SHIP) among solar technology suppliers and end customers in industry. The two held in Brazil and Mexico will be organised as part of the Solar Payback project, while the event in Spain will be managed by New Energy Update, a UK-based firm specialising in renewable market analysis. On 15 November, national solar energy association ANES will hold a full-day solar heating and cooling event, where SHIP will be a key topic of discussion. The Foro de Calor Solar en Mexico conference will take place between 12 and 16 November during the National Solar Energy Week, organised by ANES once a year. The morning session will put the focus on SHIP. Findings from the Spanish Study Solar Industrial Heat: Mexico (see the attached document) will be presented alongside successful case studies. A Solar Payback survey showed Mexico in the top spot on the list of countries that had the most SHIP plants installed in 2017, followed by India and China. In all, 36 SHIP plants corresponding to 6,411 m² came online last year. Mexican installers used either flat plate or parabolic trough collectors. On 14 November, New Energy Update will offer a 2-hour workshop titled Produce Cost Effective Heat Energy from Solar to industrial off-takers, investors and finance companies, as well as regulators and other government agencies. It will take place in Madrid during the 12th CSP Madrid 2018 conference from 13 to 14 November. “We intend to support business and investment models which increase the use of process heat and district heat generation,” said Paul Soskin, Director at New Energy Update. Well-known SHIP system suppliers – such as Solatom, Spain, Aalborg CSP, Denmark, Industrial Solar, Germany, and Rackam, Canada – have confirmed their attendance and will give presentations, too. The event is free of charge for the group of finance and policy professionals mentioned above. Still, everyone needs to register online. On 6 November, Solar Payback will hold a 1.5-hour webinar to show solar heat technology for use in the chemical and pharmaceutical industries. It will be organised in cooperation with Industrial Solar, a German supplier of turnkey SHIP systems. The 4.83 Mtoe of heat consumed in the chemical industry each year is still mostly provided by fossil fuels (see the chart below). In factories that are located in sunshine-heavy areas, solar heat is a cost-effective substitute for diesel – and in some cases even LPG or natural gas – if production continues each day of the week. The webinar will be conducted in Portuguese and take place between 11 am and 12.30 am Brazilian time of Brasilia on Tuesday 6 November. Registration is available online. 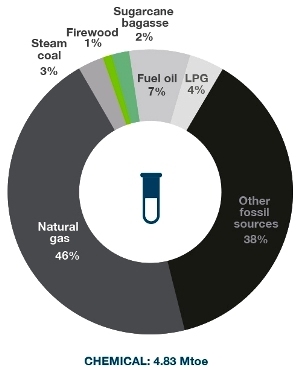 Sources of energy that covered the 4.83 Mtoe of heat use in the chemical industry in 2016 in Brazil.